Dr Mahesh Saptharishi, Avigilon’s chief technology officer (CTO), topped the 2015 rankings for our most influential people in security and fire. But Dr Saptharishi has slipped eight places to ninth in this year’s countdown. So who triumphed this time around? Variously an entrepreneur, investor, marketer and senior executive this year’s winner has seen the security industry through a number of prisms. He played a key role in propelling ASSA ABLOY to its current market dominance – the brand remains the biggest name in access control – as head of its global technologies division and later executive vice president. Our number one influencer then left the security industry for five years, taking up the role of CEO at Digital Angel Corp, which makes consumer applications and mobile games. If you haven’t worked out who it is yet, his next move perhaps will give it away: he then founded investment vehicle ACRE LLC in 2012, and promptly swooped on Vanderbilt LLC in September of the same year. Under his stewardship ACRE acquired Mercury Security in June 2013 and Siemens Security Products business in June 2015. The most influential person in fire for 2015 has also slipped down the rankings, albeit he remains the second most influential in 10th place – congratulations again to Jonathan O’Neill, MD of the Fire Protection Association (FPA). Leapfrogging O’Neill is BB7 Fire’s managing director, Ben Bradford, who jumps from 11th to fifth in the overall list. Holding dual professional status as both a Chartered Engineer and Chartered Surveyor Ben Bradford brought a wealth of multidisciplinary experience when he founded BB7, a specialist firm of consulting engineers operating in fire safety, security and business continuity. Now managing director Bradford specialises in auditing fire risk management systems and the development of policy, strategy and procedure for organisations with complex fire-risk management challenges as well as intepreting building legislation and fire safety codes and standards. The top 50 rankings were decided by a combination of public voting and nominations from a panel of expert judges from across the security and fire-safety industries – including those with an interest in all sectors, not just access control, CCTV, intruder alarms and other physical security areas but also cyber security. There were 14 judges in total. Judges were not permitted to nominate people who worked in their own business, and their nominations determined, along with public voting, the final rankings. The list below features prominent thought leaders, pioneers in product development and entrepreneurs and executives who have overseen surging revenues, profits and market share. Andy Blackwell is an experienced and highly respected in the transport security field, and is a leader in threat assessment and emergency management. Blackwell, who has a certificate in Terrorism Studies, also boasts extensive law enforcement, criminal intelligence and commercial security experience. he is a Registered Independent Security Consultant with the Association of Security Consultants, Member of the Emergency Planning Society and a Member of the Editorial Panel of Aviation Security International magazine. Wendy Griffiths has been at CEDIA since March 2001, long before anyone had really heard of home automation and when home security meant padlocks and basic analogue burglar alarms. As executive director she has helped oversee its transition to an advocate for the nascent smart home industry. Founded in the US in 1989 CEDIA (Custom Electronic Design & Installation Association) has increasingly focused on this burgeoning industry. It offers training to installers who want to get into the home automation space, which is expected to grow from $1.4bn in 2015 to $4bn in 2019, according to ABI Research. CEDIA also runs a set of four credentials that reflect defined areas of knowledge in the home technology industry. The Association was introduced to the UK in 1996 and has grown into an international association with more than 3,500 member companies worldwide. CEDIA has come to be recognised as the universal mark of professionalism for businesses within the industry. CEDIA has advanced the industry by developing timely industry education and certification, launching research initiatives, advocacy on legislative issues, building relationships with architects, builders, and interior designers, educating the consumer and recognising industry achievement. To learn more about this growth area make sure you visit the Home Automation House at IFSEC International, 21-23rd June 2016, ExCeL London. Register here to attend IFSEC 2016. CEDIA UK are exhibiting at IFSEC International 2016 between 21-23 June at ExCeL London (stand 1080). Register here to attend. Once registered you can then pre-book a meeting with CEDIA UK to take place during the show. 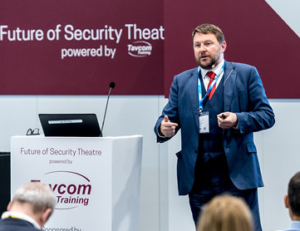 Having joined UBM – the organiser of IFSEC and FIREX International – in 2005, Peter Poole has more than a decade’s experience’ organising Europe’s biggest annual security and fire trade show. He started off as account manager at FIREX International before stints as FIREX sales manager, group sales manager for both brands and event manager for IFSEC. Now heading up IFSEC’s sales team, he plays an instrumental role in gathering the biggest, most innovative companies in the security industry under one roof. Register here to attend IFSEC International 2016 (21-23 June, ExCeL London). Brian has more than 25 years’ experience in the construction industry, working in the public and private sector, in contracting, enforcement and consultancy. In 1999 Brian joined the Building Research Establishment (BRE), before which he had been a building control surveyor for the City of Westminster, the London Borough of Tower Hamlets and Dartford Borough Council. At BRE he specialised in providing consultancy and research on fire safety standards and regulations for both public and private sector clients. Brian also led the BRE project team that made revisions to Approved Document B in 2006. In 2008 Brian joined DCLG and is is policy lead for Part B (Fire safety), Part J (Combustion appliances and fuel storage systems) and Part E (Resistance to the passage of sound) of the Building Regulations. Brian is also a Fellow of the Association of Building Engineers. Formerly Director of Technical Services and Exports at the BSIA Alex Carmichael became CEO of the SSAIB in December 2014. Carmicheal, who replaced Geoff Tate at the helm, joined the BSIA in 1998 as Technical Officer. He was promoted to Technical Manager in 2002 and then eight years ago became Director of Technical Services. “I’m delighted that someone with Alex’s skillset will be heading up SSAIB,” said Geoff Tate upon the appointment. “I’ll be handing over the reins to someone with over 15 years’ involvement in the security sector, where he’s widely known and respected. IFSEC International 2016 takes place between 21-23 June at ExCeL London. SSAIB will be on stand G500. Register here to attend. Once registered you can then pre-book a meeting with SSAIB (stand G500) to take place during the show. George R. Oliver is the Chief Executive Officer of Tyco International, the world’s largest fire protection and security company, with 57,000 employees in 50 countries and over $10 billion in annual revenue. He was elected to the company’s Board of Directors in 2012. Since the spinoff of two companies to create a more focused fire and security company in 2012, Mr. Oliver has led the transformation of Tyco from a holding company to an operating company with a sharp focus on leveraging technology and innovation to advance its leadership position in the industry. Over his more than 30-year career, Mr. Oliver has held various operations and management positions and gained substantial insight in many businesses within the industrial sector. He joined Tyco in July 2006, serving as President of Tyco Safety Products, and assumed additional responsibility as President of Tyco Electrical & Metal Products from 2007 through 2010. He was appointed President of Tyco Fire Protection in 2011. Prior to Tyco, Mr. Oliver had a more than 20-year career with General Electric (GE), where he served in operational roles of increasing responsibility in several divisions, including as President and Chief Executive Officer of GE Water and Process Technologies and President and Chief Executive Officer of GE Engine Services, as well as previous leadership roles in GE’s Aircraft Engines and Appliances divisions. Mr. Oliver serves on the Board of Directors of Raytheon Company, a technology and innovation leader specializing in defense and other government markets throughout the world. He earned a Bachelor of Science degree in mechanical engineering from Worcester Polytechnic Institute, where he serves as a member of the Board of Trustees. Tyco Security Products are exhibiting at IFSEC International 2016 between 21-23 June at ExCeL London (stand D1100). Register here to attend. Once registered you can then pre-book a meeting with Tyco to take place during the show. Eugene Kaspersky is the eponymous founder of one of the world’s biggest cyber security companies. Born in Krasnodar Krais, Russia in 1965 Kaspersky first developed his passion for cyber security in 1987 when he detected the Cascade computer virus. He established Kaspersky Lab in 1997 and has written articles on computer virology and speaks regularly at security seminars and conferences. Kaspersky Lab now operates in almost 200 countries; with more than 30 regional and country offices worldwide, it is the world’s largest privately held vendor of software security products. As ASIS International president Dave Tyson CPP has responsibility for a huge transnational members body with chapters in in more than 125 countries. A frequent speaker at industry events Tyson has also written books including “Security Convergence: Managing Enterprise Security Risk”, the first book on security convergence. “I seem to be a security expert now”, shouted a headline on Bruce Schneier’s blog in response to our tribute to the man in our 2013 rankings. “This seems so obviously written by someone who Googled me on the Internet, without any other knowledge of who I am or what I do,” he fumed (well I assume he fumed. Without emoticons you never can tell). Sorry, Bruce, but you’ve made the rankings again. Mindful of your contempt for Google as a research tool I won’t comment further, other than to say several of our independent experts were stridently insistent that he should grace these rankings once again. If you want to find out more you’ll just have to Google him. Martin served two tenures at RealNetworks. Most recently Plaehn was SVP of Product and Service Development and was responsible for delivering video, ring-back tones, messaging, and music to millions of mobile consumers through on-demand services for mobile operators in Europe, North America and Asia. From 1999 through 2004, Martin served as EVP of Technology Products and Services, and then led Real’s Casual Games Division in 2005. Prior to Viewpoint, Martin led product development for Alias|Wavefront, creating the foundation for Maya, today’s leading professional animation system. Martin joined Wavefront in 1990, became EVP of Business and Product Development, and joined its Board of Directors prior to Wavefront’s 1994 IPO and through its 1995 merger with Alias. Martin started his career as computer graphics software developer. He holds a B.A. in Mathematics from the University of California, San Diego, studied Computer Science at San Diego State University, and graduated from UCSD’s Executive Business Program for Scientists and Engineers. Control4 are exhibiting in the ‘Home Automation House’ at IFSEC International 2016 between 21-23 June at ExCeL London (stand E1060). Register here to attend. Once registered you can then pre-book a meeting with Control4 to take place during the show. Dr Barbara Lane, Fellow of Ove Arup & Partners Ltd is the leader of the Technology Group – a highly specialised team of practitioners in the fields of fire engineering, lighting design, building performance and systems, acoustics, as well as Arup’s advanced technology+research team. The group operates from the majority of Arup’s offices in the UK and provides innovative services to clients in a variety of sectors, globally. Barbara has considerable experience in the development and delivery of fire and life safety strategies from concept stage, through out detailed design, construction compliance, and specialises particularly in robust handover solutions. The fire engineering team at Arup focus beyond minimum regulatory obligations and so provide advice that also addresses complex design goals, insurance goals, as well as business continuity goals. The team has a particular interest in making high impact contributions throughout the construction/commissioning stages. This is termed Total Fire Engineering. Barbara and her team recently finished, the Birmingham New Street station project, supporting Mace in the safe operation of complex construction works, in a fully operational station and commercial space; as well as planning and delivering with Mace and their team, on a safe and timely handover. Barbara’s experience lend itself to the consideration of larger public buildings, transportation hubs, commercial property developments, and extraordinary structures; as well as construction dispute resolution (wrt fire safety expertise). Particular specialisms include the behaviour of construction materials and systems in fire, and the resulting impact on Regulatory compliance before and after building occupation. Barbara leads a programme of research and education engagement with the Engineering Department at Edinburgh University, where she is visiting Professor; she has close links with Imperial College London, as well as other UK and USA Universities. A new entry at 39, Adam Stroud began his career at Paxton 19 years’ ago on the company’s factory production line. Staff at Paxton credit Stroud for the access control innovator’s success and for driving the company’s ethos – which is centred on simplicity and quality. Adam has also helped Paxton pre-empt and react to the proliferation of on-demand services and developments in smartphone capability. Adam has been key in developing Paxton’s growing international presence. He has appointed Paxton offices in the US, France, Germany, Benelux and most recently South Africa and the UAE. Adam encourages Paxton’s development team to constantly improve the company’s product offering, based on installer and customer feedback. He has long held a vision of innovation and product diversification for Paxton, leading to the introduction of solutions to the market that don’t follow the crowd. Stroud has also overseen the introduction of IP technology to its Net2 system. He has also recognised the synergy between access control and door entry to introduce Net2 Entry to the market, and more recently bringing access control and building automation together to create net10. Paxton Access are exhibiting at IFSEC International 2016 between 21-23 June at ExCeL London (stand G1650). Register here to attend. Once registered you can then pre-book a meeting with Paxton to take place during the show. Replacing outgoing Sir Ken Knight – who topped the 2014 rankings – Peter Holland provides professional advice and support to senior officials and ministers on fire policy, national resilience, fire safety, and the inspection of Crown premises in his role as chief fire and rescue advisor. Peter also provides advice and support to the government in the event of any national emergencies. Peter Holland CBE will deliver a presentation on UK fire safety at FIREX International 2016. Holland will share his thoughts on the first day (21 June) of the three-day show, between 10:30am-11:00am in the FPA Infozone, which is stand E60 in ExCeL London. To register for FIREX International click here. A highly experienced and commercially astute Security Professional, with considerable experience as both a user and supplier of security services. I recognise the need to employ sector specific professionals to compliment the team that I manage, in order to ensure the highest quality of service provision. I play an active part in the leadership of several professional associations, including the UK Chapter of ASIS, The Worshipful Company of Security Professionals, TINYg and the Executive Committee of OSAC in the UK. Specialties: Manned Security Services, Investigations, Financial Crime Management, General Management. Paul has been at the vanguard in the development of IP security systems for the past 12 years and he has been involved in the installation of over 100 IP CCTV and IP Access Control systems across UK and Europe. Paul is a founder director at Sunstone IP Systems, which are specialists in bespoke surveillance systems, with significant expertise in Megapixel IP CCTV, IP Access Control and Digital Wireless Technology. We work in partnership with our customers to deliver robust, high quality, cost saving solutions. Our systems are fully scalable to ensure that it will continue to meet the future needs of any business. We have designed and installed proprietary digital systems for data centres, Independent schools, colleges and local authorities in the South East and throughout the UK. Sunstone was a finalist at the Security Excellence Awards, in the category of SME Security Installer of the Year and finalist at the Security Innovation Awards in 2014. Furthermore, Paul was nominated in the top 40 ‘Most Influential People in Security’ at IFSEC in 2014. Hu Yangzhong has led Hikvision Digital Technology through its astonishing growth since its foundation in 2001. With more than 25 years in the IT and security industries Yangzhong has broad experience in formulating innovative strategic plans in the ever-changing surveillance market. Under his stewardship Hikvision has become world’s biggest supplier of CCTV and video surveillance equipment, surpassing its nearest challenge in 2012, according to a report by IHS, and jumped to the top three in A&S’s 2014 Security 50 rankings. Since being publicly listed in 2010 the Chinese giant has achieved market capitalization of US$32.3bn. Hikvision’s reach extends to more than 100 countries, with its cameras deployed at the 2008 Olympic Games, 2010 World Expo, 2014 World Cup in Brazil, Safe City project in South Korea, Philadelphia recreation centers and Dun Laoghaire Harbour in Ireland. Established in 2001, Hikvision employs over 13,000 employees, including a research and development staff of more than 4,000. Hikvision is exhibiting at IFSEC International 2016, which takes place between 21-23 June at London’s ExCeL (stand number E800). Register here to attend IFSEC International. Once registered you can then pre-book a meeting with Hikvision to take place during the show. Debbie joined the Fire Research Station (FRS) at BRE in 1984 after completing her PhD at the University of Birmingham in Metallurgy and Materials Science. In the subsequent years Smith been influential in a wide range of fire related work in research, testing, certification and consultancy, notably in material fire behaviour, turbulent diffusion flame dynamics and development and validation of mathematical modelling approaches. Her contributions to European fire test methods, classification schemes for construction products and the development of fire safety engineering standards make her a worthwhile addition to this list. More recently Debbie has taken a keen interest in sustainability and its influence on fire protection and construction methods. Debbie, who is also chair of the European Committee CEN TC127 on Fire Safety, awarded an OBE in the Queen’s birthday honours list for services to fire safety. Now Director of Fire Sciences and Building Products for BRE Global Debbie steers research, protection engineering and investigation and testing and approvals of fire products, systems and services associated with passive fire protection and suppression. An experienced management professional with extensive European market experience, Kate has a proven track record of delivering growth targets, driving new business across multiple channels and regions. In Sweden, Kate coordinated all business functions relating to the Yale brand and its products across the Scandinavian region. Kate has extensive experience of complex stakeholder management with partners including Verisure Innovation AB (Securitas Group) and Aptus AB. Kate focussed on developing digital residential security systems to integrate with the connected home (IoT) as part of the ASSA ABLOY Innovation to Growth strategy. Kate has over 10 years experience of running international projects in the retail sector, both for retailers and suppliers. She is an accredited CIM marketer and has attended management leadership courses at IMD in Lausanne. In 2016 she was promoted to Managing Director for Yale across the EMEA region. One time ONVIF Steering Committee chairman Jonas Andersson is Senior Vice President for product planning and strategic marketing for the security solutions division of Samsung Techwin. Joining the company in January 2013 he also brought a wealth of knowlesge from an 18-year period working in a number of senior roles for Axis Communications, including director of video product management and video solutions and business development director. Andersson was Chairman of the ONVIF (Open Network Video Interface Forum) Steering Committee between November 2008 and December 2012. Raman Chagger is responsible for its research and development activities. He is a UK technical expert on a number of domestic and commercial fire detector and fire alarm warning device standards. He is a committee member and holds Chair responsibilities for a number of committees for the EN 54 series of standards for fire detection. His research covers the fundamental aspects of fire detection and fire warning that support EN standards and European codes of practice. Some of the topics covered so far include smoke detection in high ceiling spaces, false alarm causes, smoke detector capabilities, visual alarm device warning effectiveness and developing test methods for assessing video fire detectors. Founder and CEO of the physical industry’s leading trade body Mike Tennent more than warrants a place on the top 50 countdown. Part of the renowned Linx International Group, Tavcom Training is the worlds leading provider of accredited security systems training courses. We provide award winning BTEC certificated courses to installers, operators, managers and designers of Closed Circuit Television (CCTV), Network IP, intruder alarm, access control, fire alarm and all other types of electronic security systems. David Gill formed Linx International Ltd in 1987, following a successful career in the Police service. Linx International provides security advisory services to a wide range of organisations. David’s particular expertise is in Crisis Management (Planning & Response) and investigations of malpractice and criminality in the workplace. David is a Fellow and former Vice Chairman of the Security Institute, he is the Registrar of the UK’s Register of Chartered Security Professionals and was one of the first ten Chartered Security Professionals to be admitted to the Register. David has lectured on a variety of security disciplines at leading universities. As a member of an expert advisory group David has contributed to the drafting of the National Occupational Standards for Security Consultants. David has had a number of articles and guides published and he has given evidence as an Expert Witness at the High Court. David holds an MSc in Security Management and is a qualified trainer in a number of Security disciplines. John Davies, who led the buyout of access control veterans TDSi from Norbain in 2003, began his working life at British Aerospace Military Aircraft Group in 1979. In 1981 he left the UK to work with Litton Industries Inc in Japan, Singapore and the USA working on Oil & Gas and Petrochemical projects. Thereafter he moved again, this time to South East Asia to establish a business for a Canadian environmental services company, where he negotiated a 20 year service support contract with the Malaysian government for the supply of air and water pollution monitoring data which could be used to prosecute polluters. Returning to the UK in 1997, he took up a directorship at Zellweger Analytics a manufacturer of toxic gas detection equipment, and moved to a telecom software start up in 1999. During his time as MD at TDSi export sales have grown from 40% of the business to 50% plus. John is active in the BSIA (British Security Industry Association) where he was Chairman of the Export Council from 2010 to 2013 and also sits on the Security Sector Advisory Group (SSAG) for UKTI DSO. Andrew Nicholls retired from Mitchells & Butlers PLC in January 2016 where he was employed as the Head of Security and Licensing with responsibility for a team of Security and Licensing Managers. Andrew’s work involved the management of security requirements and licensing compliance across an estate of almost two thousand premises. Andrew was also responsible for managing the company response to a crisis. He is a regular speaker at trade conferences and sits on several national working groups. Andrew is a director of the Security Institute and a Fellow of the British Institute of Inn Keeping. Andrew has helped to develop a number of security initiatives in the licensed trade and is a keen supporter of the Cross sector Safety and Security Communication project where he is a member of their senior management board. He is also a member of the Metropolitan Police Strategic Business Crime Forum and Chairman of the Food and Drink Security Association. In 2015 Andrew received a Chief Superintendents Commendation for his work during National Counter Terrorism awareness week. In 2016 Andrew was very proud to me made a Freeman of the City of London. Andrew has been a member of the Institute since 2009 and a Board Director since 2011. He was appointed Deputy Chairman in 2015. Emergency & disaster specialist, former Chief Fire Officer and head of UK fire & rescue resilience and government advisor. More recently, Jon headed organisational development for Capita following their purchase of the blue light training facility at Moreton-in-Marsh and was responsible for corporate training and creation of the ‘School of Resilience’. Jon left in 2015 to establish Resilience Advisors Ltd, a new company with ‘the Network’ at its heart! The aim of the Network is simply to spread the knowledge of some of the most experienced resilience practitioners into the business sector. Ten years served as a Chief Fire Officer in the Midlands – Hereford & Worcester and Gloucestershire – of leading development of local & national policy and commanding a number of major incidents. Jon is a long-standing member\chairman of multi-agency Resilience Forums and regional coordinating groups overseeing planning, preparation, response and recovery phases of emergencies and infrastructure compromises including; civil unrest, major fires and repeated wide-area flooding. As an international strategic adviser to UK Government, Jon is trained and has exercised with International Search & Rescue teams as a component of DFID’s ‘UK Aid’ programme. As a qualified expert within the European Civil Protection Mechanism he has also led heavy USAR, mass pumping and flood rescue deployments as part of UK capabilities in Europe & USA. A regular in the top 10 Keith Bloodworth’s influence continues to reverberate. Bloodworth, who co-founded Axis Communications with Martin Gren (who also makes the top 10) has since become a key figure in the emergence of PSIM (Physical Security Information Management) at the helm of the company he founded, CNL Software. Forty years as an entrepreneurial IT expert Bloodworth has been well placed to exploit the growing covergence of physical and digital security. Mark Button is Director of the Centre for Counter Fraud Studies at the Institute of Criminal Justice Studies, University of Portsmouth. Mark has written extensively on counter fraud and private policing issues, publishing many articles, chapters and completing seven books with one forthcoming. Some of the most significant research projects include leading the research on behalf of the National Fraud Authority and ACPO on fraud victims; the Department for International Development on fraud measurement, Acromas (AA and Saga) on ‘Cash-for-Crash fraudsters’, the Midlands Fraud Forum, Eversheds and PKF on ‘Sanctioning Fraudsters’. Mark has also acted as a consultant for the United Nations Offices on Drugs and Crime on Civilian Private Security Services and for the United Nations Development Programme on Improving the Civilian Oversight of Security in Turkey. Steve is currently Chairman of the Board of Directors of the Institution of Fire Engineers and also the Institutions International President for 2015/16. He has an extensive career background in the UK fire and rescue service, his last appointment being as Assistant Commissioner of the London Fire Brigade until 2014 where he was responsible for Operational Resilience. This portfolio covered aspects such as the Operational Planning for significant events in London, Contingency Planning for a range of scenarios, delivering the London Fire Brigade Emergency Planning responsibilities and the delivery of Specialist Operational Capabilities in London, including components of the UK National Resilience Capabilities Programme. For the Olympic and Paralympic games in 2012 Steve undertook a Gold Command role in London and was involved in the work required to ensure that specific measures for the games were correctly planned, implemented and tested. Steve led a team that delivered the arrangements in London and around the UK to provide a consistent and robust approach to the risks faced by UK Fire Services during the games period. Steve has a broad experience base in strategic operational command and has attended a number of high profile events in London, including the civil disturbances of 2011 and the Vauxhall helicopter crash in Central London in 2013. In 2014 Steve was heavily involved in the command and control arrangements for the flooding that affected large parts of the UK. Building on his experience during the Olympic period Steve was the Chief Fire Officers Association lead on Interoperability and a member of the Joint Emergency Services Interoperability Programme Board. Steve has extensive experience in the resilience and civil contingencies field and has worked in forums tasked with ensuring effective response and recovery arrangements are in place in London and Nationally in the UK. Steve has over 25 years of experience in Emergency Management and Resilience following a period of service in the Royal Air Force. He holds a MSc and is a Chartered Fire Engineer. He became the Institutions 2015/16 International President in July 2015. Steve takes up a new appointment as Head of London’s Resilience Programme in September 2015 and will become the senior point of contact for resilience issues in the Capital, with responsibility for implementing the responsibilities of the Mayor of London, the Greater London Authority and coordination of the key response and recovery agencies. ONVIF chairman since 2013 Per Bjorkdahl oversees a body which oversees the development of technical standards for IP, simplifying interoperability, a process that in the coming years we think will lead to a contraction in overall numbers of surveillance suppliers. Now if that doesn’t meet the standard for ‘influential’ then we don’t know what does. ONVIF, founded by Axis, Sony, and Bosch Security Systems, has 31 full members that also include Honeywell, Sony and Pelco and 438 member organizations in total. Nick Coombe has more than three decades’ experience in the Fire Service and nearly two in fire safety. He is vice chair of the CFOA Business Support Group, CFOA lead on Enforcement, CFOA rep on the RA Competency Council, an IFE risk assessment panel member and a Member of BSI FSH/2. He also contributed to the DCLG guides. A highly motivated former senior police officer with particular expertise in Counter Terrorism (CT) strategy, protective security, CT training, risk assessment and quality assurance. He has a vast experience of risk and crisis management, with an enviable reputation for delivery at both an operational and strategic level. Widely respected nationally and internationally within law enforcement and Government and business. He has developed best practice across a range of business sectors. Unparalleled knowledge of the Crowded Places strategy, protection of hazardous sites, Dangerous Substances and the Critical National Infrastructure. Wilf Butcher has played a prominent role in the fire industry since his appointment to CEO of the ASFP in 2007. “Wilf has been the driving force behind a series of seminars on Passive Fire Protection touring the FRS Regional HQs. He also supports many aspects of passive fire protection, through networking; lobbying and generally cheer-leading. Roy Cooper is the Managing Director and co-owner of Professional Security Magazine which has been established since 1990. It serves the UK security market for both end users and installers alike. Roy has been in the security industry since 1972 and has worked his way up from being an apprentice alarm engineer for Chubb Alarms through to doing sales for installation companies, manufacturer and distribution. He has worked on/sold Intruder alarms, CCTV and Access control systems and is well connected within the electronic side of the security business within the UK. Don Randall began his career serving with the City of London Police, with specific emphasis on fraud and counter terrorism, rising through the ranks to spend four years as Deputy Head of the Fraud Squad. He was Managing Director at JPMorgan Chase before joining the Bank of England in 2008 and was elected Chairman of the Global Banks Heads of Security Group in June 2013. Randall holds a number of other official positions, including Chair of the City of London Crime Prevention Association, and is cofounder and Vice Chairman of the Cross Sector Safety & Security Communications initiative, which created the law enforcement private/public sector partnership successfully used in advance and throughout the Olympic Games. In October 2013 Randall was awarded a Security Excellence Award for Outstanding Contribution to the Security Profession. Randall continues as the Cyber Ambassador for the Bank of England in a consultative capacity. He is also senior consultant to Bivonas Law, a City of London based law firm which specialises in high value and complex disputes. Martin Harvey has been involved in the fire and security industry for nearly four decades. The chairman of the Security Systems section of the BSIA has sat on countless British standard committees and working groups. Beginning his career with EMI Electronics, he later helped develop the UK’s first microprocessor based intruder alarm in the R&D department of AFA Minerva. He then moved into the marine and offshore division, designing control systems for North Sea rigs and platforms, before moving into project management of a range of fire and security equipment. In 2012, he was appointed Director of Regulatory Affairs at Tyco International, where he remains to this day. Mike Gillespie, MD and founder of independent information security and physical security consultancy Advent IM, is also director for cyber strategy and research at the Security Institute. Advent IM is specialises in holistic security management solutions for Information Security, HMG Information Assurance, Business Continuity and PCI-DS. Gillespie is also a prolific thought leader, writing for Computer Weekly and Tomorrow’s FM, among other publications. Mike is also a CLAS consultant, while Advent IM is licensed to use CESG IA Policy Documents to support and deliver a range of HMG IA Training Courses. Michael has more than 15 years experience working in security management throughout the UK gained in both the public and private sectors covering areas as diverse as shopping centres, offices, distribution centres, event security, diplomatic security, media organisations (such as national newspapers and television channels) as well as The London Stock Exchange. He has worked with major blue chip clients to define security strategies and policy as well as put in place robust operational security procedures. He has written tenders, managed the tender process and undertaken numerous operational security audits and threat assessments to work in partnership with clients to strengthen their security provision. A member of The Security Institute, ASIS UK, The International Professional Security Association (as its Chairman) and a Liveryman of The Worshipful Company of Security Professionals. Michael remains in touch with the very latest developments within the industry through a highly developed and extensive network of professional contacts covering all aspects of security both here in the UK and internationally. Michael is a regular speaker at security events – IFSEC 2013 and 2014, 4th Saudi Arabian Safety and Security Conference (Co-Chairman), East-West Conferences in Monaco, Barcelona, Rome and Paris, Security TWENTY14 and TWENTY 15 conferences in Nottingham, Bristol and Manchester and contributes to security publications both in print and online. Up one place on last year Simon Banks is Group Managing Director and founder of CSL DualCom. Simon is a keen supporter of the Engineers of Tomorrow initiative and also sits on the Government’s Trailblazer development group which has written the new curriculum for the 2017 Apprentice academic structure. He co-founded the Apprenticeships for Security campaign in early 2011, placing over 2300 young apprentices into careers within the Security Industry so far. Considered an expert within the Security Industry, he was appointed to the NSI Board of Directors to represent the security sector. Peter French MBE CPP has been employed within the service sector since l979. As a Founding Director he has used his past experience to develop, with our clients, specific initiatives. He holds a number of non-executive posts advising on human resource planning, motivation and psychometrics. He is European Member ISMA, and former Board Member London Crimestoppers. He is a Past Master and Trustee of The Worshipful Company of Security Professionals. He currently advises a number of community employment projects in the UK and overseas. Member of a regional taskforce committed to returning heritage buildings to achieve use by raising £10m supported by the Princes Trust BITC. Jonathan, who became Managing Director of the Fire Protection Association back in 1999, sits on numerous government and ministerial advisory bodies including the Business & Community Safety Board, the Arson Control Forum, the Integrated Risk Management Advisory Board and the Operational Guidance Strategy Board. During 17 years in the role O’Neill has overseen the opening of a fire test facility to keep the organisation at the forefront of fire protection innovation and represented UK insurers on the Prevention Forum of Insurance Europe, sat on the Executive of the Fire Sector Federation and sat on the boards of BASEC, SSIAB and BAFE. Boasting 18 years’ experience in developing smart video analytics technology and network camera software/hardware Dr Mahesh Saptharishi leads the company’s engineering team and recently-announced Centers of Excellence R&D initiative. As CTO he is responsible for driving innovation in Avigilon’s product and intellectual property portfolios, identifying strategic technology capabilities and exploring new business opportunities. Writing this piece for Forbes on what the security landscape might look like in 2020 Dr Saptharishi certainly leaves his mark on the debates shaping the industry’s strategic direction too. Avigilon launched the world’s first 7K surveillance camera last year and have moved aggressively in the burgeoning video analytics market, acquiring patents from Behavioral Recognition Systems Inc (BRS Labs), FaceDouble Incorporated, ITS7 Pty Ltd and the VideoMining Corporation for a total of just over $13m. As CEO of the British Security Industry Association James Kelly leads the biggest trade association for the professional security industry in the UK. Its members account for more than 70% of privately provided UK security products and services (by turnover) including the manufacture, distribution and installation of electronic and physical security equipment and the provision of security guarding and consultancy services. Now at the helm for six years has overseen strong growth in media activity. In 2013-14, the Association’s messages reached an audience of 410 million people, a seven-year high and a 72.9% increase on the previous 12 months. “The BSIA was an organisation that had a good reputation and was well regarded in political circles but what I have tried to do is bring together the different sectors of the association and manage it more as a holistic whole. So I have tried to get involved in both the manpower and the electronic sectors of the association. Tony Porter was appointed Surveillance Camera Commissioner in March 2014. He has a combination of business and law enforcement expertise. He is an intelligence specialist (most recently within the financial sector) and retired senior police leader. His experience spans community and business engagement, international counter terrorism and serious and organised crime. provide advice and information to the public and system operators about the effective, appropriate, proportionate and transparent use of surveillance camera systems. Tony Porter is discussing steps to compliance with the Surveillance Camera Code of Practice at IFSEC International 2016 on 21 June, 12:00-12:30, in the Security Management Theatre, London ExCeL. Register here for your ticket to IFSEC International 2016. Garry is the Head of Security & Emergency Planning for Westminster Abbey having previously been Head of Group Security Operations for DeLaRue plc and prior to that a Lieutenant Colonel in the Royal Military Police where he saw service in Africa, Iraq and the Falklands. This broad professional background has been complemented by him holding several Boardroom appointments in the SyI including Standards Director, Deputy Chair, External Relations Director and now Chairman, as well as leading on the Wilf Knight Academic competition for several years. He achieved registration as a Chartered Security Professional (CSyP) in 2011 having initially been a member of the working party for writing the CSyP framework. Before establishing BB7 he served as director for a large independent fire engineering consultancy operating in emerging economies like Vietnam, Dubai, Abu Dhabi, Libya, Qatar and Nigeria. As a Chartered Building Control Surveyor in London and the South East he also acquired experience and knowledge in building pathology, Construction, Building Legislation, Codes and Standards. Ben – who is also one of IFSEC Global’s prolific contributors – has chaired the FIA Fire Risk Assessment Council’s Professional Standards Working Group for several years and was a founding member of the Fire Engineering Council. As the Principle author of PAS 7: Fire Risk Management Systems Specification from the British Standards Institution Ben has had a profound impact on best practice for organisational fire risk management strategies and operational challenges. Ben Bradford is part of a panel – also including Andy Shuttleworth and Dr Kathryn Woolham O’Brien – who will discuss the challenges around ‘Educating the engineers of tomorrow’ at FIREX International 2016. The debate takes place between 15:50-16:20 in the FIREX Expertise & Guidance Theatre at London ExCeL. Register here to get your ticket. Profession Martin Gill FSyI is a Professor of Criminology, an author of 13 books and over 100 articles, and editor of the Security Journal. He maintains a close involvement in research with ASIS, and as the founder of the Security Research Initiative. As senior lecturer in security risk management at Portsmouth University Dr Alison Wakefield is course leader of the BSc Risk and Security Management and the Professional Doctorate in Security Risk Management. Alison is also Vice Chairman of the Security Institute, the UK’s main member association for security practitioners. She recently chaired a Security Institute working group that mapped out the pathways to becoming a Chartered Security Professional and undertakes consultancy work in security strategy, recently supporting the global engineering company Arup on a major project for the Provincial Government of the Western Cape, South Africa. Alison has authored Selling Security: The Private Policing of Public Space (Willan Publishing, 2003), which was shortlisted for the British Society of Criminology Book Prize 2003, and she is editor of The Sage Dictionary of Policing with Jenny Fleming (Sage, 2009). Alison recently urged security professionals to reject Brexit in the forthcoming referendum. She is also speaking on the ‘Inspirational women in security’ panel at IFSEC International 2016 (21-23 June, ExCeL London), joining the chair of the National Association of Healthcare Security, Jayne King, and WiS lead at the ASIS UK Chapter, Dawn Holmes, among others. The panel discussion will take place on 23 June 2016 in IFSEC’s Security Management Theatre. Register for IFSEC here. Martin Gren, who co-founded Axis Communications in 1984, topped the list in 2013 and is only one spot away in the latest rankings. Always looking ahead and avoiding complacency (as evidenced by this recent interview on the internet of things on IFSEC Global) Gren ] helped invent the world’s first network camera in 1996 when few people used the internet and those that did used dial-up access. Still edging ahead of HikVision in terms of market share in network video Axis Communications has led the migration from analogue to digital video surveillance and is also considered to be the second biggest supplier of video encoders. While Ray Maurittson has long since taken over as president and CEO of Axis Gren remains a senior member of the board and is as animated by innovation as he was starting out three decades ago. Joseph Grillo is a 30-year veteran of the electronic security and identification industries with a track record of successfully growing, acquiring and restructuring businesses. In 1993 Joe was appointed National Sales Manager for HID Corporation. He participated in the management buyout of HID from Hughes Aircraft/General Motors in 1995. From 1995 to 2001, Joe became Vice President of Sales and Marketing, COO and eventually President as HID grew from a $15M card and reader company to the dominant $100M industry leader. He successfully led the effort to sell the company to Assa Abloy in 2001. At Assa Abloy, Joe created and managed the Identification Technology Group, completing more than a dozen acquisitions, primarily in Europe. In 2005, he was promoted to Executive Vice President of the parent company Assa Abloy AB, and appointed President of its Global Technology Division, which included HID Global, Assa Abloy Hospitality and Besam Automatic Doors. In that role, he successfully managed the $700M division with 3,000 employees in 29 countries and completed many additional acquisitions. Joe retired from Assa Abloy in 2008. In 2012, Mr. Grillo and his former colleague Will West formed ACRE, LLC as a platform to consolidate acquisitions in the electronic security industry, with a special focus on access control. They successfully acquired the Schlage SMS business from Ingersoll Rand – now known as Vanderbilt Industries – in September 2012 and then completed the acquisition of Mercury Security in May 2013, along with a third partner, Steve Wagner, the President of Mercury. On 1 June 2015 Vanderbilt completed the acquisition of the Siemens Security Products business with Joe as its Managing Director based at the new headquarters building in Wiesbaden, Germany. – An exclusive preview of Aliro 2 access control solution utilising a Mercury firmware platform, this exciting new system paves the way for Vanderbilt’s future migration strategy. – Demonstrations of the highly successful SPC intrusion panel including the new SPC Connect – a cloud based innovation which enables users to customise how they view their system data and manage access rights. A world debut for our new Eventys CCTV range – perfect for small to medium sized installations that require up to 20 cameras. IFSEC International 2016 takes place between 21-23 June at ExCeL London (stand F1050). Register here to attend. Once registered you can then pre-book a meeting with Vanderbilt to take place during the show. Top 50 Most Influential People in Security and Fire 2016: Results Announced Last year Avigilon CTO Dr Mahesh Saptharishi topped IFSEC Global’s top 50 influencers. Who is our most influential person in security and fire this time around? No mention of Grillo’s time at Digital Angel? Disaster. In 1993 Joe was appointed National Sales Manager for HID Corporation. He participated in the management buyout of HID from Hughes Aircraft/General Motors in 1995.http://congtysangoviet.com/san-pham/bang-gia-san-go-ngoai-troi/ From 1995 to 2001, Joe became Vice President of Sales and Marketing, COO and eventually President as HID grew from a $15M card and reader company to the dominant $100M industry leader. He successfully led the effort to sell the company to Assa Abloy in 2001.